Christian Yelich or Javier Baez for National League MVP? The talk around Major League Baseball over the last few days has centered around the National League MVP discussion, with Christian Yelich of the Milwaukee Brewers and Javier Baez of the Chicago Cubs at the forefront of the discussion. The aforementioned players should be considered the favorites to take home the award, no matter what Odds Shark criminally says. And that’s what this article is about, yet for those who read this site regularly (thank you so much), this will be a little different than usual. While there will still be some analytics dripped in, this post will mostly consist of a rant that Ryen Russillo would be proud of, because frankly, I’m a little annoyed about this MVP discussion, and I think I deserve to speak my mind. So I’m just going to start typing and see where the keyboard leads me. ***Side note: Before Cardinals’ fans get all up on their perch and start tweeting me that Matt Carpenter should be involved in this discussion, let me just say that I wholeheartedly agree. He’s been more valuable than Baez, in my opinion. But back to the Yelich vs. Baez debate. My frustration started with Dan Patrick. On Tuesday, Dan Patrick of The Dan Patrick Show aired his usual “Play of the Day” segment, and for the first time in probably the show’s history, a Milwaukee Brewers’ play was featured. The play just so happened to be Yelich hitting for his second cycle of the season. That’s great! Finally, a small-market team getting some love and publicity on a national radio show. Ahhh, life is good. But then Patrick starts talking about Yelich and pronounces Yelich’s last name as “Yelick”. He does this not once, but twice. Now, I know Patrick isn’t that in-tune with baseball, because he still thinks pitcher wins and RBIs matter and are a good judge of skill, but he’s still a relatively smart guy when it comes to sports. He should, at the very least, know an MVP candidate’s name, even if the candidate plays a sport The Dan Patrick Show never touches on. But because Yelich plays for the Brewers and not the Cubs, Yankees or Red Sox, Patrick butchers the name because, in all honestly, he probably couldn’t pick Yelich out of a lineup. It’s sad, but true, kind of like my love life. Christian Yelich: Hits for another cycle, is great on offense. Javy Baez: Hits as well a Yelich, plays incredible defense at multiple infield positions, runs the bases as well as anyone in baseball, is made of magic. This is not a difficult MVP decision. Here’s a table that shows that is unequivocally untrue. You see those numbers up there that are in bold? Those are the categories in which Yelich leads Baez, and it’s really not all that close either. Try again, Nation. Besides, do we really want to give the MVP to someone who has a .329 on-base percentage? Hell, I have a higher OBP than that. Bleacher Nation also states that Baez plays incredible defense at multiple infield positions. It’s true that Baez plays solid defense at more than one position, but to color it incredible? I don’t think so. Baez has posted 5 defensive runs saved at shortstop, 2 DRS at second base and 2 DRS at shortstop this season. League average is zero for those new to the Defensive Run Statistic. Baez has good range and a strong arm, but the word “incredible” should be saved for those who deserve it, like Andrelton Simmons. Yelich, on the other hand, has won a Gold Glove in the past as an outfielder and is capable of manning multiple outfield positions. While his DRS numbers (3 DRS in right field) are down a smidge in 2018, he’s still considered a top-notch defender, and definitely not an inferior glovesman to Baez. Next argument, Nation. Baez runs the bases as well as anyone in baseball, or so Bleacher Nation would have you believe. Let’s take a gander down the road of baserunning statistics! Buckle up, Cubs’ fans, because it’s going to be a bumpy ride. If you go to FanGraphs and click on its baserunning statistic, you’ll see both Yelich and Baez on the first page of the leaderboard. But like the United States Olympic Men’s Hockey team in 1980, Yelich is the winner over Baez. (Yes, I did in fact compare Yelich to the gold-medal winning 1980 Olympic hockey team). Yelich has been worth 5.3 BsR — the 11th-highest total in MLB. Baez sits all the way down at 26th with a 3.8 BsR. To sum up like Inigo Montoya in The Princess Bride, Baez is truthfully — I know it’s sometimes hard for Cubs’ fans to tell the truth — not one of the best baserunners in all of baseball. But Yelich sure is. Now, I honestly didn’t mean to call out Bleacher Nation as much as I did, but I like dealing with facts when it comes to baseball talk. The facts speak for themselves, even though I just wrote them down for you all in case you didn’t hear them the first time. You can probably tell by now that I’m a Brewers’ fan, and that of course I’m going to side with Yelich over Baez. While the former is true, readers of this site should know I’m not a biased fan. Go through my archives. Look at my most recent article in which I called out Brewers general manager David Stearns. While I’m not biased, that doesn’t mean I don’t get to side with the Brewers from time to time, which is why I have no qualms saying Yelich should be the National League MVP, and there’s one more argument I have to bolster my case. According to FanGraphs’ WAR, Yelich has been the most valuable player in the National League this season with 6.1 WAR. Lorenzo Cain — Yelich’s teammate — is second on the leaderboard, with Baez tied with Anthony Rendon at 5.3 WAR for third place. WAR isn’t the end-all and be-all statistic, but it’s pretty damn telling, and it’s telling us that Yelich deserves the MVP. And here’s the final killshot: Without Javier Baez, the Chicago Cubs would still be a playoff team. Without Christian Yelich, the Brewers wouldn’t even be sniffing a Wild Card berth. You’re right, Bleacher Nation, this isn’t a difficult MVP decision. This entry was posted in MVP Talk and tagged Chicago Cubs, Christian Yelich, Javier Baez, Milwaukee Brewers, MVP on September 20, 2018 by Justin Schultz. Did David Stearns make a mistake? The Milwaukee Brewers (73-59) sit 4.5 games behind the Chicago Cubs and currently lead the Rockies by a game in the race for the second Wild Card spot. Once upon a time, they had a sizable lead in the division, and once upon a time — on July 10 — they were a season-best 18 games over .500. Milwaukee has spent a total of 76 days in first place this season, and they seemed primed for an October appearance, yet since the Major League Baseball trade deadline on July 31, the Brewers are 11-12, all the while losing significant ground on the Cubs and St. Louis Cardinals in the NL Central. The argument can be made that Milwaukee’s biggest weakness leading up to the deadline was its offense. Not many can disagree with that sentiment. For the season, the Brewers have been shut out 10 times, and have scored two or fewer runs 42 times in the team’s 121 games, for a record of 9-33 in those contests. Their 92 wRC+ as a team in the first half ranked 19th in the majors. The Brewers needed offense, and Stearns attempted to address that need when he acquired Moustakas and Schoop. Though those two haven’t exactly elevated the offense — at least so far — as much as the Brewers had hoped, at least the front office made an attempt to bring more runs to the team. The same cannot be said for the pitching side of the club, and that’s where Stearns may have made a mistake. Let’s first look at how Milwaukee’s rotation has performed before and after the trade deadline. Stearns has said over and over that he and his front office value his team’s starting pitching more than the outside world. That’s been the case all season. But it wasn’t hard to see regression was coming as quick as another Avengers movie, and even Stearns had to know his starters — the best one being Jhoulys Chacin — couldn’t keep this up. No move was made, however, as the Brewers showed interest in the starting pitching market, but failed to pull the trigger on any deal. As a result, Milwaukee’s rotation has been unreliable since July 31. Every pitcher on the table above — with the exception of Archer — has been absolutely brilliant (small sample size alert) since switching teams. Gausman seems to be finally reaching his potential, Happ is as reliable as ever, Lynn has figured something out after a miserable short tenure with Minnesota and Hamels thinks it’s 2011 again. The Brewers were rumored to have interest in all of these pitchers, and although I didn’t see anything that linked him to Milwaukee, Mike Fiers — who was traded after the non-waiver deadline — has been lights out with the Athletics, as well. Aside from Archer, acquiring these players came at a relatively low cost, a cost the Brewers could’ve easily managed. Stearns’ love for the rotation he constructed has cost the Brewers wins, and it has allowed the Brewers to play second fiddle to the Cubs once again. A rotation consisting of Chacin, Junior Guerra, Freddy Peralta, Chase Anderson and Wade Miley — who has the second-largest difference between his ERA (2.32) and FIP (3.99) among starters with at least 50 innings — doesn’t inspire much faith, except, apparently, to Stearns. For a team that has playoff hopes, and for a team who, on paper, has a formidable offensive lineup, the rotation is a sight for sore eyes, and Stearns should be criticized for not improving it. The Brewers still have the ability to add a starter or two if they claim someone on revocable waivers or work out a deal for a player who went unclaimed. However, the market is rather dry, and there aren’t too many eye-opening arms out there. Milwaukee has shown interest in Nationals’ starter Gio Gonzalez, and although his 2018 performance to date has been disappointing, he could still give the Brewers some quality innings down the stretch. Stearns said “we’ll find out” when asked if he made a mistake by not acquiring a starting pitcher. Well, I think we can safely say that he did, and while there are other factors involved, it’s a big reason why Milwaukee’s playoff odds have significantly dropped. This entry was posted in Trade Talk and tagged David Stearns, Milwaukee Brewers, MLB Trade Deadline on August 26, 2018 by Justin Schultz. Who are the Brewers getting in Jonathan Schoop? With barely seconds to spare before the Major League Baseball non-waiver trade deadline clock expired, the Milwaukee Brewers made a significant trade. It wasn’t for a starting pitcher and it wasn’t for a catcher. Instead, it was for Jonathan Schoop — a second baseman — causing a logjam in the infield, much like the one the Brewers dealt with earlier this season in the outfield. We could talk about how trading for Mike Moustakas and Schoop is redundant, and how Milwaukee’s infield defense will likely suffer. We could talk about that. But I don’t want to talk about that or about where everyone will play, as that will surely figure itself out like most things in life do. I want to talk about Jonathan Schoop, the hitter. Schoop comes to Milwaukee with a 0.7 WAR, a 90 wRC+ and a 3.3 walk percentage. I picked those three numbers because they’re important when it comes to evaluating a player, but also because they’re not favorable. At first glance, Schoop doesn’t look like much of an offensive upgrade, especially considering his numbers are very similar to Tyler Saladino‘s stat line. Granted, Schoop has nearly 250 more plate appearances than Saladino, but the numbers say Saladino has had the better season up to this point. Still, the Brewers optioned out Saladino in favor of Schoop, and honestly, it makes sense. The 26-year-old second baseman is having a down season, which is especially rough considering the year he put together in 2017 when he put up nearly 4 WAR. Ryan Braun hasn’t been worth 4 WAR since 2012. Travis Shaw never has. The Brewers just added a player capable of providing four more wins than the league-average replacement player for this year’s playoff run and all of next season for a relatively cheap price. There’s no doubt Schoop upgrades Milwaukee’s offense now and in the immediate future. Schoop went deep 32 times last year, and 25 times the year before that. He started off the season slow but has been Targaryen hot as of late, evidenced by his seven home runs over his past 10 games. He’s starting to become the player he was a year ago, and Miller Park will only aid him in that journey. Also, consider this: Schoop is hitting the ball in the air 38 percent of the time, yet his home-run-to-fly-ball ratio is down nearly two percent from his breakout season. Hopefully, Miller Park helps that positively regress. Schoop’s power is undeniable, but if you’re looking for someone who gets on base a lot, Schoop’s not your guy. Schoop’s .338 OBP in 2017 was a career high by a mile, and that was largely due to a .330 BABIP — also a career best. His walk rate flirts with three percent nearly every year, and that’s somewhat of a problem. Of qualified hitters in 2018, Schoop currently has the third-lowest walk rate, as only Dee Gordon and Salvador Perez have walked fewer times. That could change, though. The Brewers preach patience at the plate, and that could easily and quickly rub off on the newest member of the team. The Brewers walk 8.7 percent of the time, or the 14th-most in MLB. That’s the middle of the pack, sure, but the Orioles — Schoop’s former team — walk just 7.4 percent of the time. That’s the 26th-worst mark in baseball. Don’t be surprised if we see an uptick in Schoop’s walk rate soon, simply because he changed teams. The Brewers’ infield — in terms of offensive output — was one of the worst in baseball. Jonathan Villar was in the midst of a second-consecutive down year, Brad Miller showed very little at the plate during his brief tenure in Milwaukee, Orlando Arcia has a 27 wRC+ and Hernan Perez is the same as he’s ever been. But now, with Schoop and Moustakas joining Jesus Aguilar/Eric Thames and Shaw in the infield, the Brewers have one of the best all-around offenses in baseball, at least on paper They still don’t come close to competing with the fire powers in the American League, but one could argue they have the best lineup in the NL. David Stearns improved his team in an unconventional way and sacrificed defense in the process, but with shifts and Milwaukee’s 10th-highest strikeout rate from its pitchers limiting the balls in play, rarely will the flaws in the defense show. Stearns may have just found a market inefficiency. Personally, I would’ve preferred Brian Dozier over Schoop, though that extra year of Schoop control is pretty darn appealing. There’s only one thing we need to concern ourselves with when it comes to analyzing Schoop: does he make the Brewers a better team? This entry was posted in Trade Analysis and tagged Jonathan Schoop, Milwaukee Brewers, Tyler Saladino on August 2, 2018 by Justin Schultz. 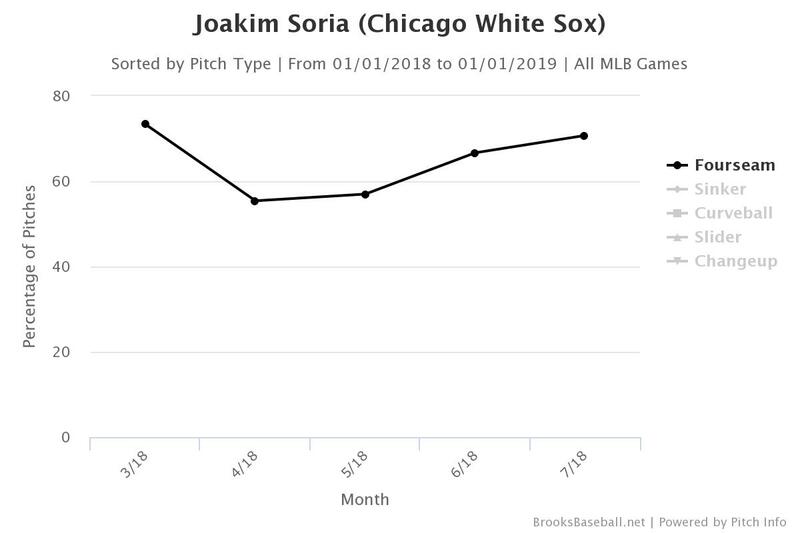 Who are the Brewers getting in Joakim Soria? The Milwaukee Brewers made a trade Thursday, albeit not for a starting pitcher or hitter, the two biggest needs on the club. Instead, they landed Chicago White Sox reliever Joakim Soria in exchange for LHP Kodi Medeiros and RHP Wilber Perez. This marks the second time in as many seasons that general manager David Stearns has orchestrated a trade for a reliever with the White Sox, the first being Anthony Swarzak, who ended up pitching quite well for the Brewers. This time around, however, things are a little different. Like in 2017, the Brewers are in contention for a playoff bid, and like in 2017, the Brewers are trying to overcome the Chicago Cubs, but unlike in 2017, the Brewers feel more confident they have the pieces to compete. They didn’t feel like that a year ago, which is why the only trade deadline moves they made were acquiring Swarzak and Neil Walker. Milwaukee had holes elsewhere on the roster, but the team didn’t think it was worth the price to fill them. That belief has changed, as the Brewers have been rumored and linked to almost every available player on the trade market, and while J.A. Happ and Zach Britton have found new homes elsewhere, Milwaukee still has its sights set on numerous players. One of them, apparently, was Soria. But who exactly are the Brewers getting in Soria? In 38.2 innings for the White Sox, the 34-year-old righty has pitched to a 2.56 ERA and an even more impressive 2.15 FIP, totaling 1.4 WAR after being worth a total of 1.7 WAR last season. Soria’s strikeout rate (29.9 percent) is his highest mark since 2009 and his walk rate (6.1 percent) hasn’t been lower since 2014. He’s been able to generate more swings and misses than ever before, and a lot of that has to do with a rejuvenated fastball. Soria throws a fourseam fastball, as many players do. He throws said fourseam fastball about 62 percent of the time and has recently decided to rely on it more. It’s really no surprise he’s utilizing it more. According to FanGraphs’ pitch values, Soria’s fastball has been worth 10.0 runs. Only 10 other relievers in Major League Baseball have had more effective fastballs according to this metric. He’s thrown his fastball 420 times, and opposing hitters are batting just .231 and slugging .295 against it, despite it averaging around just 93 mph. Soria’s fastball hasn’t been this good since his first two years in the league 10 years ago. While Soria has a $10 million mutual option for 2020, it’s highly likely that Soria’s stay in Milwaukee will be short. His buyout will only cost the Brewers $1 million, and the White Sox have already sent that amount over as part of the trade agreement. Soria will be a rental, but that’s okay. He’ll immediately improve a bullpen that is already dominant. The Brewers are a better team with Soria, and while the cost — depending on how you feel about Medeiros — wasn’t cheap, that’s the price of doing business, and ultimately the price to get into the postseason. This entry was posted in Trade Analysis and tagged Joakim Soria, Kodi Medeirous, Milwaukee Brewers, Wilber Perez on July 26, 2018 by Justin Schultz. The Milwaukee Brewers sit at 55-43. And while no other team in the National League has more wins (the Chicago Cubs also have 55), they still find themselves 2.5 games behind those Cubs in the NL Central. The Brewers have lost six games in a row and eight of their last 10 games. They couldn’t have finished the first half in a worse fashion, causing Brewers fans across the great state of Wisconsin to collectively lose their freakin’ minds. It’s true that the Brewers just finished an excruciatingly grueling part of the schedule — 22 games in 21 days — so the offensive struggles are understandable. However, it’s also true that the Brewers need help. The team that has exceeded expectations desperately needs a few more pieces if they want to continue exceeding those expectations, and not only get into the playoffs, but make a deep run. When the Brewers organization believes it has a chance for October baseball, they don’t hesitate to make bold moves via the trade market. They acquired CC Sabathia just before the All-Star break in 2008, and they sent the farm to acquire Zack Greinke before the 2011 campaign. In both seasons, the Brewers made the playoffs. Both trades paid off. Both trades were worth it. Anyone who says differently can argue with me on Twitter. I won’t respond because you’re ridiculous, but you can argue all the same. The Brewers believe they can make a run in October, and why shouldn’t they? They signed Lorenzo Cain (3.6 WAR) to a massive deal this winter and simultaneously traded for Christian Yelich (2.4 WAR), two players who have been instantly valuable in Milwaukee’s success. The Brewers have been leading the Cubs for almost the entire year, and despite the recent underwhelming play, the Brewers look like a team that is destined to play fall baseball for the first time since 2011. General manager David Stearns will not hesitate to make that a reality. He’s going to make moves, and they’re going to be significant ones. This is the obvious one. Machado and the Brewers have been linked for months, and there’s a real possibility that the two sides will work out a deal. The Brewers are in desperate need of middle infield help, as they currently rank 29th in shortstop WAR (-0.7) and 26th in second base WAR (-0.2). The Orioles are reportedly asking for Milwaukee’s No. 2 prospect Corbin Burnes — who has been lights-out impressive since joining the big-league squad — and while the Brewers are reluctant to part with him, I doubt Stearns would balk at the chance to bring in one of the game’s best bats. Machado has a 156 wRC+ with 24 home runs and 3.8 Wins Above Replacement, and he would join a lineup that already includes Cain (125 wRC+), Yelich (121), Jesus Aguilar (159), Travis Shaw (115) and Eric Thames (135). Machado would instantly make the Brewers one of the better offensive teams in baseball. The problem with trading for Machado is that he’ll only be around for a couple of months. Like Sabathia in ’08, he’s a rental, and the Brewers will have to decide if the opportunity cost is worth a few months of a phenomenal player. Looking at Happ’s statistics, you might question why Happ is on this list. The 35-year-old starter has an ERA and FIP over four and lasted just 3.2 and 2.2 innings in his last two starts, respectively. Yet the Brewers should be all over the southpaw. Happ will be a free agent after this season, and due to his current stats, won’t cost much to acquire. The Blue Jays aren’t in the running for a playoff spot, so they should have no hesitation in trading a mid-30s pitcher who has a 4.29 ERA. But if we look past his ERA — like the Brewers should — we see that his strikeout rate of 26.5 percent is the highest of his career. He’s also walking fewer than three batters per nine innings. On the negative side, he’s already allowed 17 home runs after allowing a total of 18 last season, and admittedly, that might be a problem in Miller Park. Happ is by no means an ace, but adding him to Milwaukee’s rotation will give it a much-needed boost. He’s averaging 5.7 innings per start, and while that might not seem like a lot, take into account that Milwaukee’s starters have averaged just 5.3 innings per start. They’re right in the middle of the pack in that category. Jhoulys Chacin is due for some regression, Junior Guerra just landed on the disabled list, Chase Anderson doesn’t look like his 2017 self and Brent Suter and Wade Miley are, well, Brent Suter and Wade Miley…uninspiring. The Brewers need rotation help, and Happ would be a cheap piece that could help propel the team to the playoffs. The Brewers have long been rumored to have interest in the Tampa Bay Rays ace, but there’s been nothing in the rumor mill as of late. In fact, I’m not even aware anything has even been whispered about Archer in recent weeks. Maybe this guy has heard something. Unlike Happ, Archer would be the immediate No. 1 pitcher for the Brewers. Though his strikeouts are considerably down from the past few seasons, Archer can dominate games and carry a team on his back if need be. That’s the type of hurler the Brewers covet. They need someone who can pick up the slack if the offense has a quiet night — which has happened all too often in 2018. Archer has posted an ERA over four each of the last three seasons, but he’s always been a guy whose FIP outperforms his ERA (3.68 career ERA, 3.49 career FIP. The same is true again this season. I truly believe that Archer is in need of a change of scenery, and he could once again be a shutdown ace if in the right situation. Of everyone that is seemingly available on the trade market, Archer will cost the most. He’s just 29 years old and doesn’t become a free agent until after the 2021 season. And did I mention that he’s currently locked into an unbelievably team-friendly contract? Archer is due just $16.5 million over the next two years, which is why the Rays will be asking for the farm in any trade talks. The odds the Brewers acquire him are low, as it would, in all likelihood, force them to give up both Keston Hiura and Corbin Burnes. Nonetheless, not only would Archer almost guarantee the Brewers a playoff spot, he’d stick around for at least another two years, and Stearns loves cheap players who have multiple years of team control. It’s possible Stearns and the Rays pull the trigger on a deal involving Archer, but not likely. Before 2018 began, I was against the Brewers acquiring Merrifield from the Kansas City Royals. I thought his 2017 season was a flash in the pan. Even though he broke out, his wRC+ was barely over 100 and his OBP was below .330. I thought Jonathan Villar could put up similar numbers while costing the Brewers next to nothing. Well, Merrifield has taken his break out to another level. The 29 year old has already been worth 2.8 WAR, and he’s raised his OBP by 54 points and his walk rate by 4.6 percent. He’s hitting for considerably less power, but the Brewers — who are among the top 10 in home runs in MLB — don’t really need another power hitter. They need someone who can get on base at a high clip, and someone who is a force on the base paths. Merrifield does both of those extremely well. However, like Archer, Merrifield will cost an arm and a leg to acquire, considering he’s not even arbitration-eligible until 2020. Still, I think Stearns could pull the trigger on him in order to upgrade the team’s middle infield. Don’t look at Dozier’s batting average. Don’t look at his on-base percentage. Heck, don’t even look at his wRC+. They’re all bad. But I don’t care. Dozier needs to be a Brewer. For the past few seasons, Dozier has gotten off to rotten starts at the plate, but then goes absolutely nuts in the second half. Why can’t he do it again, except this time in a Brewers uniform? The two have already been linked together. Dozier is set to be a free agent this winter, and since the Twins’ season has been a bitter disappointment, they have no reason to keep an aging second baseman on the roster any longer. He’s not in the organization’s long-term plans, so it would make sense if they ship him off for a prospect. Dozier would add massive power to the Brewers’ lineup, and he could even be more dangerous in a stadium like Miller Park. If Stearns doesn’t want to pay up for Merrifield, getting Dozier to Milwaukee is a no brainer. The non-waiver trade deadline is quickly approaching. In just two weeks, numerous players will be changing cities and switching teams, and if the Brewers expect to still be playing in October, they’ll soon be welcoming new players to their city. Do they go all-in and acquire someone like Machado? Or do they make small improvements like adding Happ? Only time will tell. This entry was posted in Trade Talk and tagged Brian Dozier, Chris Archer, J.A. Happ, Manny Machado, Milwaukee Brewers, Whit Merrifield on July 17, 2018 by Justin Schultz. 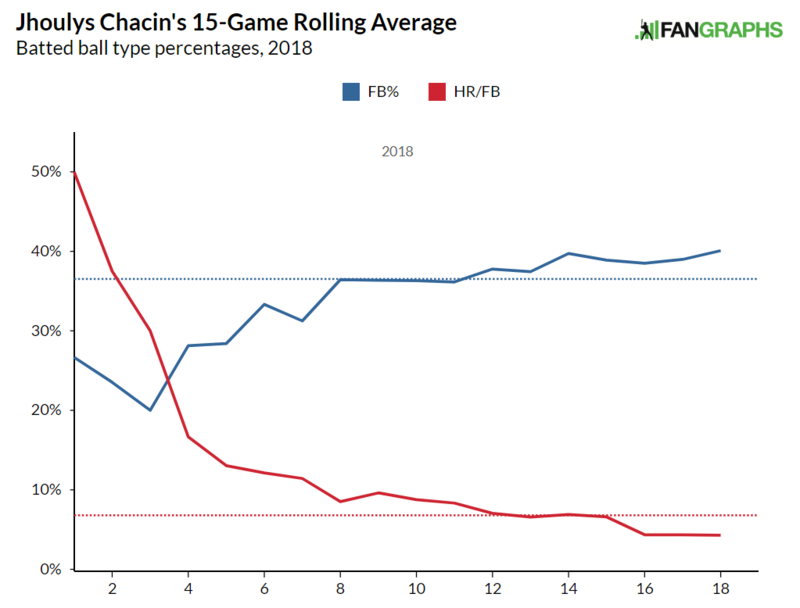 Let’s begin with Jhoulys Chacin‘s projections from before the season. Only three pitchers with enough innings to qualify have allowed fewer home runs per fly ball than Chacin. The 30-year-old veteran is running his lowest HR/FB% since his last year with the Colorado Rockies in 2013. His ability to keep the ball in the yard is why his ERA and FIP look great, but also why his xFIP — which normalizes home runs based on fly ball rate — sits at a meaty 4.72.We can figure out why hitters aren’t connecting for home runs by simply looking at Chacin’s exit velocity on fly balls. As of July 1, that number is 90.7 mph, meaning the average fly ball hit off Chacin averages 90.7 mph off the bat. Only sixteen starting pitchers have done a better job at limiting hard contact on fly balls.This chart shows Chacin’s exit velocity on fly balls over the last three seasons, along with his HR/FB%. This season isn’t even Chacin’s best when it comes to fly-ball exit velocity. That feat happened a year ago, though he somehow still managed to give up quite a bit more home runs than he has in 2018 thus far. And he was pitching in notorious pitcher-friendly Petco Park in San Diego! And therein lies the problem. Chacin is due for regression, and it’s quite possible that it will hit hard and hit fast. As you already know, Chacin’s HR/FB% is the second lowest of his career. That’s good. His fly-ball percentage, though, is the highest of his career save for 2012 when he played at Coors Field. That’s bad. Here are those sentences in picture form. Chacin is allowing more fly balls than ever before, yet he’s giving up the fewest number of long balls of his career. That’s incredibly unsustainable. To make things even more confusing, his home stadium is Miller Park, a haven for home runs. But looking more closely at the numbers, it kind of makes sense in a way. Chacin has pitched a total of 97 innings, with 57.2 of those innings coming on the road. He’s thrown just 39.1 innings in homer-happy Miller Park. That, along with his low exit velocity, could explain why his HR/FB% is so low. He’s giving up more fly balls at Miller Park than on the road but fewer home runs. Nothing about Chacin’s season makes sense, which is why what he’s doing won’t be able to last much longer. Chacin has been a pleasant surprise for the Milwaukee Brewers, and he’s making those who clamored for the team to sign a high-profile pitcher this offseason look foolish. But unless the entire 2018 season is an outlier, Chacin just won’t be able to keep this up. I’m sorry to burst any bubbles, but despite his 3.71 ERA and equally strong 3.92 FIP, Chacin should be one of the reasons why general manager David Stearns should acquire pitching help before the trade deadline. This entry was posted in Home Run History and tagged Jhoulys Chacin, Milwaukee Brewers on July 2, 2018 by Justin Schultz.